Kensington Gardens, London – Even gloomy old London manages to muster up some springtime sakura to frolic under. What’s more, any London Hanami newbies who want to flex their Japanese conversation skills can attend the Japanese Conversation Group’s annual Hanami event there. However life doesn’t stop at Watford Gap, so for those of you outside London the BBC has a great round-up of Hanami spots across the UK. Roihuvuori, Helsinki – 200 trees have been donated by local residents and businesses and every year it plays host to annual Hanami events with cultural displays like tea ceremony. Washington, DC. – West Potomac Park hosts one of the largest Hanami events in the world, the National Cherry Blossom Festival. First planted in 1912 as a gift from the Mayor of Tokyo, now thousands of trees throng the area. In Japan, it’s traditional for groups to stake out areas in parks ahead of time by laying down the now ubiquitous blue ground tarp and having a friend guard their spot until the party (sometimes even over night!) Now, we can’t recommend this approach (you wouldn’t want to be the first person to get an asbo for Hanami), but it does pay to plan ahead. Scout out where you might want to celebrate in advance, by the time the blossoms have bloomed you may find that all the good parks are jam-packed. Also it’s best to work out who will be taking what home with them and how they’ll do it ahead of time. One year we ended up taking a shaved ice machine (yes, one of those) home with us on the metro. Not fun. Loads of delicious Japanese dishes make great finger food, we particularly recommend onigiri, inari sushi, kushiage, and kashiwa mochi for low-mess snacks. In Japan it’s not unusual to see Hanami groups gathered around a hot plate or takoyaki griddle, so why not bust out the portable stove and make some yakitori, teriyaki or yakiniku right there on the spot! Plus it might warm you up if it gets a bit nippy. To cut down pre-Hanami stress get your mates involved. Get everyone to bring a dish or snacks and it means less to worry about. Even better, indulge in a stylish shokado bento, cool kokeshi maiko bento or super cute bento lunchbox kit to help carry your goodies. No more paper plates to throw away, now you’ve got something to carry your food in and your own plate! 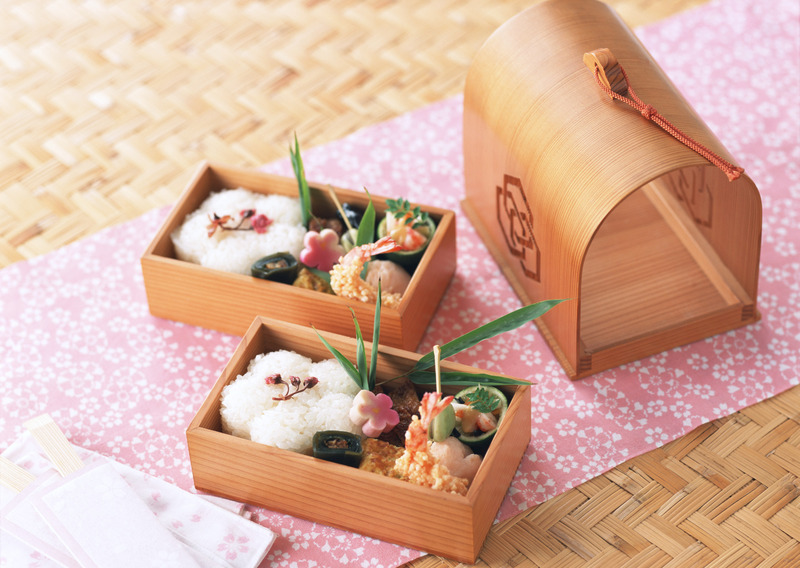 Similarly bento picks and mini-sauce bottles are must-haves for Hanami picnics, they’re fun and great for keeping things mess free. 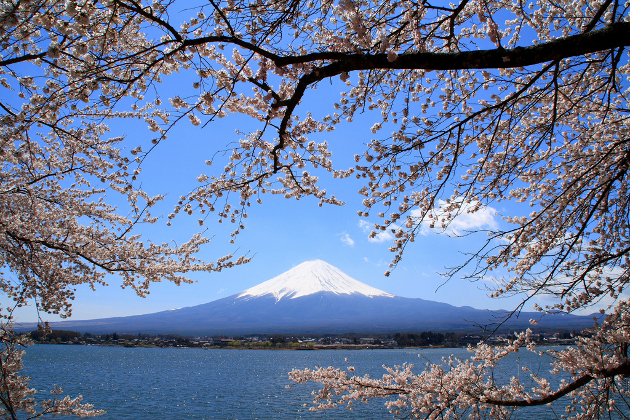 We’d be remiss in talking about Hanami if we didn’t mention sake. 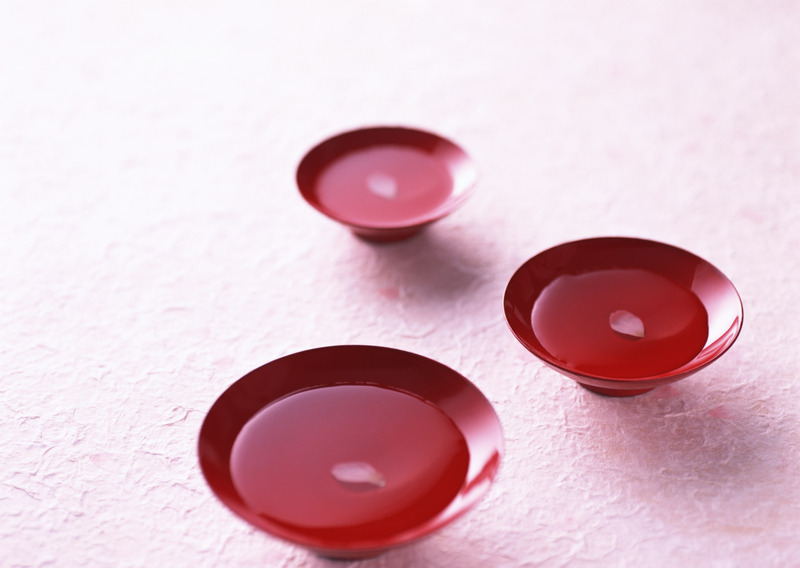 Sake has been an integral part of Hanami traditions since the very beginning and some believe a drop of sake is essential to properly appreciate the flowers. When you’re picking out your tipple we suggest getting individual bottles so you don’t need lug around cups (it also means there’s less to get spilled if anyone gets a bit boisterous.) Sake’s not the only drink for Hanami, we like peach (momoshu), plum (umeshu) and sakura flavoured drinks to give everything a proper springy feel. If alcohol is not your bag or the weather is a bit less than desirable for sitting on a plastic sheet for four hours put some warmed amazake or hot green tea in a thermos and take it along. – Thanks to skyseeker at Flickr for the cherry blossom & fuji image. – Thanks to yukishana at Flickr for the cherry blossom & tarps image. 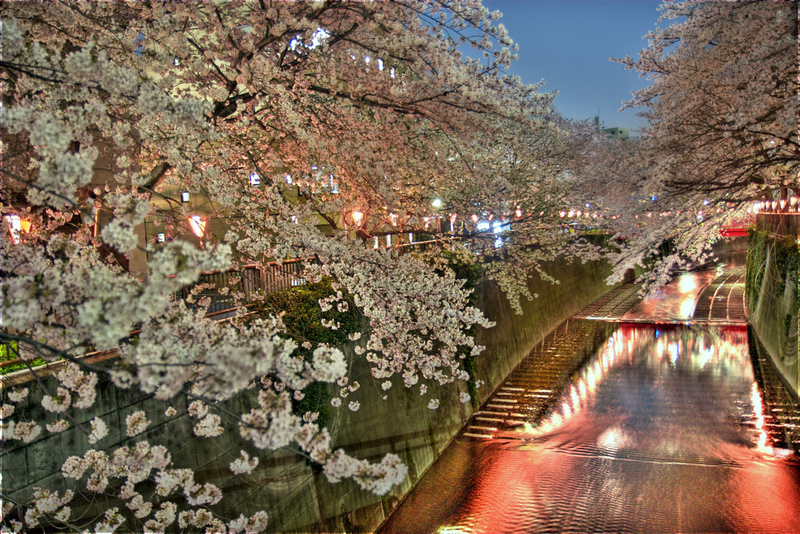 – Thanks to SF Brit at Flickr for the cherry blossom & night time river image. 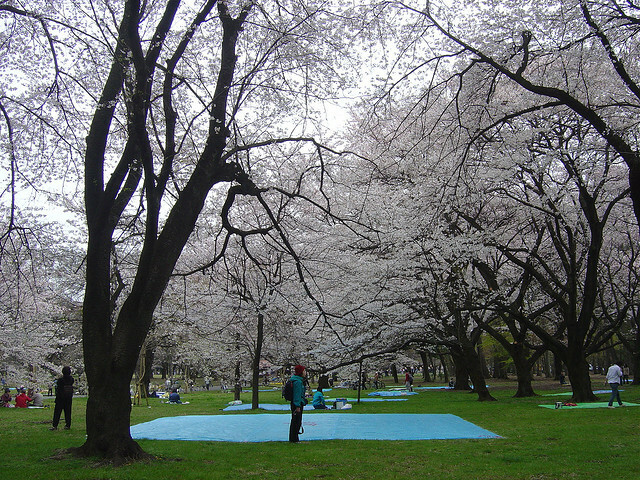 Posted in Uncategorized and tagged hanami, sakura, spring. Bookmark the permalink. I’m so pleased you don’t need to be in Japan to enjoy hanami! I’m waiting for better weather but I’m heading down to my local avenue of cherry trees (about 2 minutes from home). I’ve just got back from Tokyo and Kyoto to celebrate hanami it was the most amazing thing and the weeping cherries are so beautiful . The site will stay with me forever in my heart. It’s great now I can celebrate again in the uk as our blossoms are only just coming out.